In conversation, people avert their gaze from one another to achieve a number of conversational functions, including turn-taking, regulating intimacy, and indicating that cognitive effort is being put into planning an utterance. In this work, we enable virtual agents to effectively use gaze aversions to achieve these same functions in conversations with people. We extend existing social science knowledge of gaze aversion by analyzing video data of human dyadic conversations. This analysis yielded precise timings of speaker and listener gaze aversions, enabling us to design gaze aversion behaviors for virtual agents. We evaluated these behaviors for their ability to achieve positive conversational functions in a laboratory experiment with 24 participants. 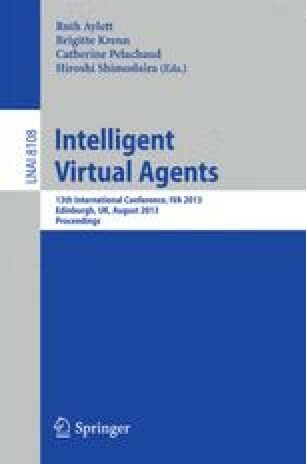 Results show that virtual agents employing gaze aversion are perceived as thinking, are able to elicit more disclosure from human interlocutors, and are able to regulate conversational turn-taking.